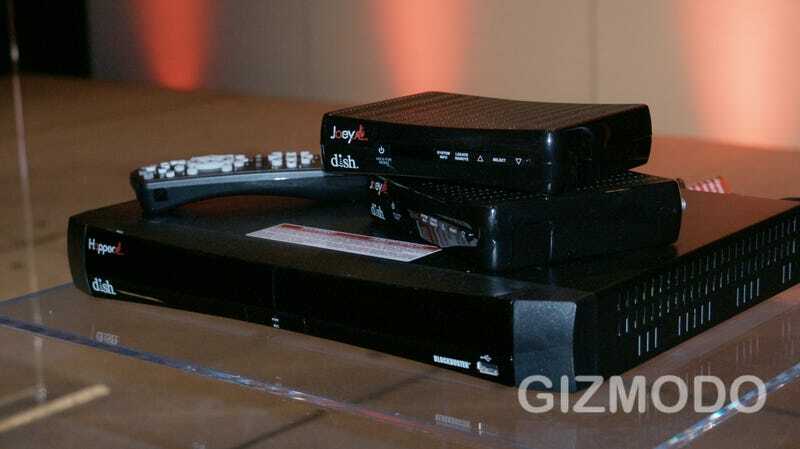 Dish Network just introduced its new multi-room DVR, weirdly named Hopper, which can record three shows at one time (while playing back a fourth show), has a 2TB hard drive which can store 250 hours of HD programming, a Slingbox adapter, which will let certain users watch what's on Dish Network from anywhere in the world AND a super neat PrimeTime Anytime feature that I'm not even sure is legal. The way the Hopper works is that the Hopper acts as the main DVR for your entire home other 'Joeys', which are client receivers, access everything on the Hopper. Like whats en vogue in the DVR world these days, you can record a show on one DVR and watch it on the other. And what will probably solve all your lost remote control woes, the Hopper can 'phone home' a remote control and make it beep. That's fine and all but the best (or at least, most unique) feature of Dish's new Hopper DVR is that three hours of HD primetime content (8PM est to 11PM est, for the east coast) from ABC, NBC, CBS and FOX are available on-demand on Hopper and Joeys for up to 8 days after the original air date. It's like an autorecord feature of all the best network shows, the difference is that this on-demand content doesn't use your DVR's hard drive at all. There's also a Slingbox adapter for the Hopper too, just plug the Sling adapter into Hopper and you can watch everything on your DVR and live TV from anywhere you have Internet.